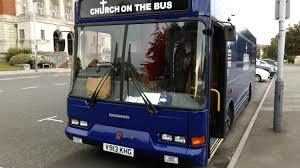 CHRISTIANS TOGETHER FOR CHESTERFIELD: SUPPORT CHURCH ON THE BUS TODAY! You may know of us and know we're based at St Thomas' Church and have been feeding the homeless from our converted library bus since 2004. We are in dire need of a replacement bus and are making an appeal to the Aviva Community Fund for money to achieve this. You may have seen the article on this in last week's Derbyshire times? Another route is to go to https://www.avivacommunityfund.co.uk/voting/project/view/4-1127#plus, but it might direct you to a page to register first. They will only accept someone to vote once they have registered, which involves giving their name and email address. You then have 10 votes and you could use all 10 votes for us!